We invited Orkney International Science Festival visitors to take part in a series of discussions about spirituality, ethics and compassionate communities at the end of life in September 2016. The festival’s director Howie Firth describes the annual event as, “something for the whole community to enjoy, something fresh and creative, with surprises and excitement and sheer enjoyment”. We were encouraged to bring our “narrative element and fresh new thinking” to the Orkney International Science Festival. Among the pure science and “flashes and bangs”, Howie believed there would be an appetite for discussing end of life issues at the festival, which is in its 27th year. For the Glasgow End of Life Studies Group, our main research project is Global interventions at the End of Life – social, comparative and historical analysis to promote global improvement. This a four year study which is funded by the Wellcome Trust. Medical anthropologist and medically-qualified doctor Dr Shahaduz Zaman is our Research Fellow on this project, and is working on a paper about compassionate communities at the end of life. He’s currently doing field research, and has been meeting community palliative care volunteers in West Bengal and Bangladesh. Bioethicist Reverend Dr Hamilton Inbadas is Research Associate on our Global Interventions at the End of Life project, and is working on a paper on the role of spirituality at the end of life, based on his recent PhD thesis. Hamilton is an ordained Church of South India minister and has studied English literature, theology and journalism. By introducing our academic research at the festival we hoped Hamilton and Zaman would spark formal and informal discussions about end of life issues, and that the audiences in turn might give us some new perspectives which we could use to strengthen our research. 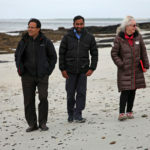 On the opening night of the festival we travelled by boat to the island of Shapinsay where Zaman spoke about his research at the Boathouse. The event was hosted by the Shapinsay Development Trust, whose team introduced us to the local nurse practitioner. He gave us some valuable insight into end of life care issues on Shapinsay before the talk began. After Zaman’s talk the audience took part in a rewarding discussion about the meaning and value of compassion at the end of life. Everyone got involved in the conversations, which could have continued for much longer than the time allowed. We had to dash off to catch an out of hours ferry service, back across the dark sea towards the Orkney mainland. The following evening we held two consecutive events in Kirkwall Town Hall, with the support of Kate Jackson as chair of the panel discussion. Kate is founding editor of the online hospice, palliative and end of life care publication ehospice International. In the run up to the festival, Howie Firth suggested that we work together with a current NHS clinician and members of the Church of Scotland, in order to provide a range of perspectives. Howie introduced us to Professor Robin Taylor who is a respiratory physician and an ordained Church of Scotland minister. Robin has recently returned to Scotland after 35 years working in New Zealand and is helping the NHS seek solutions to the problem of the ‘bad death’. Robin and Hamilton each gave a short talk about the role of spirituality and bioethics at the end of life. Their talks were followed by an audience question and answer session. Robin’s participation in the event added a valuable clinical dimension to the discussions. Watch footage of the event on YouTube. Originally from South Africa, Kate Jackson is now based on Orkney. She works hard to communicate end of life care messages around the world. In our final session of the week, Zaman introduced his research to an audience in Kirkwall Town Hall. He introduced the concept of a compassionate community, described some experiences from his field research around the world, and spoke about the barriers to compassion in end of life care. Directly afterwards, Kate chaired a panel discussion with Hamilton and Zaman, asking ‘can we build a compassionate community?’, taking questions and views from the audience. Or watch a video of the compassionate communities discussion in Kirkwall Town Hall. We’re very grateful for Howie Firth for giving us the opportunity to take part in the festival, and for the University of Glasgow for providing a grant for us to attend. I’d also like to thank Lynne Collinson and Nic. Thake of the Shapinsay Development Trust for giving us such a warm welcome to their island. And thanks to Robin and Kate for lending us their time and expertise. Last but not least, thanks to everyone who came along and took part in the discussions. Whether distance and logistics will allow it or not I’m not sure, but there is certainly an appetite for future collaboration. I hope you find these resources useful. I’d be very pleased to hear your comments below or you can get in touch with us by email endoflifestudies@glasgow.ac.uk.